A new study investigating the topic of inactivity finds that spending six or more hours sitting around after or before work increases the risk of dying from eight of the ten most common causes of US deaths -- including cancer - compared to fewer than three hours of daily sitting. The link exists regardless of how much people walked or did other forms of moderate to vigorous physical activity. The study was published last month in the American Journal of Epidemiology. In the United States, over a quarter of people aged 6 and older - approximately 82 million people - are physically inactive, according to a 2018 Physical Activity Council's report. 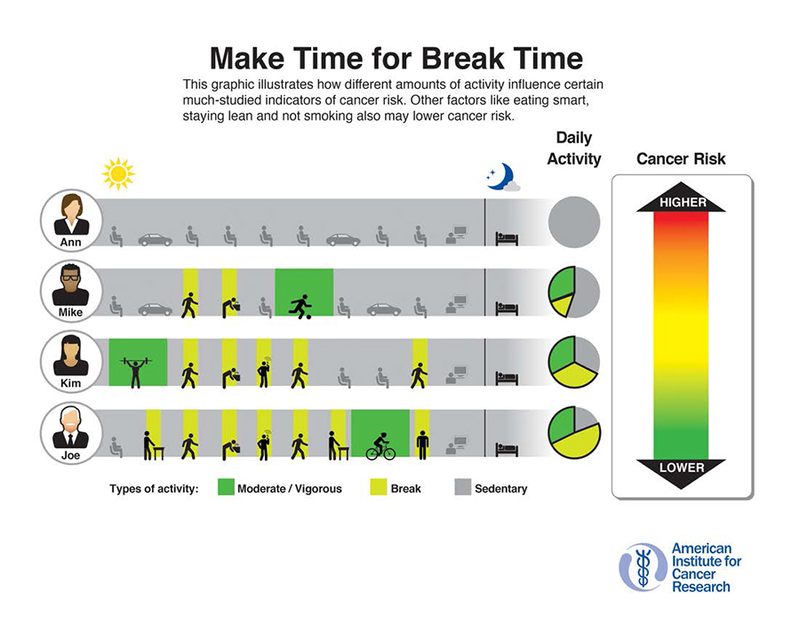 For lower cancer risk, AICR recommends limiting the amount of time spent sitting for extended periods of time. This study investigated how leisure time sitting linked to 22 specific causes of death and mortality in general. The study analyzed data from approximately 128,000 men and women who had no major chronic disease at the start. After an average of 20 years, there were 48,784 deaths. Cardiovascular disease and cancer were the top causes of death. Sitting six or more hours a day during off-work hours was associated with a 19 percent higher rate of death overall compared to sitting less than three hours per day. Risk was significantly higher for 14 of 22 specific causes of death in the US, including the majority of leading causes. These include cancer, coronary heart disease, stroke, diabetes, kidney disease, liver disease and suicide. This was after taking into account known risk factors, including age, smoking, diet and weight. Adjusting for moderate-to-vigorous activity levels did not change the results. For cancer, there was an 11 percent increased risk of dying for those reporting six or more hours a day compared to less than three hours. Cancer, along with kidney disease, were the only causes of death where associations differed by gender, with the link stronger in women compared to men. The study has several caveats. Researchers did not have information on physically active or sedentary people were at work, for example. The study also depended on self-reported data. There are several possible factors that could explain the findings, according to the authors. It is possible that time spent sitting is associated with other unhealthy behaviors, such as excess snacking. Other associations including death from suicide, Parkinson's disease, Alzheimer's disease, nervous disorders, and musculoskeletal disorders are less clearly understood. For these causes of death, it is plausible that underlying conditions that would result in excess time spent sitting may explain the associations. Too much sitting time may also have negative metabolic health affects, such as on insulin levels, and obesity-chronic inflammation. Sedentary ways of life can act through multiple pathways - they may alter the metabolic environment of the body in ways that are conducive to cancer development, according to the latest AICR/WCRF global report. More research is needed to to better understand how sitting time links to mortality in general and cancer. An earlier study by many of the same authors also found that longer sitting time linked to higher risk of total cancer risk in women but not men. The study authors conclude that considering the increase in leisure-time spent sitting in westernized countries over the past several decades, this highlights the importance of modifying sedentary behavior, in addition to exercise, as a health behavior that can improve public health. The study was funded by The American Cancer Society.